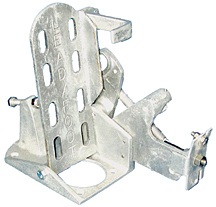 The T&R "Leadfoot" foot throttle is made of cast aluminum with stainless hardware for corrosion resistance and light weight. Enables you to keep both hands on the steering wheel for safety during high speed operation. Spring tension will pull the throttle back to idle when foot is removed from pedal unlike hand operated throttles.